Overall Personality: When animosity is all one has ever known, that comes to be the language that one begins to speak. 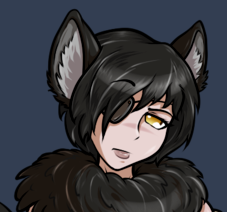 Her penchant for aggression is not unfounded as years of faunus grounded assumptions of ineptitude have rendered her embittered to, not only humans, but most people that she meets. Her skills as a medic came to be out of necessity more than choice, tending to the injured hunters returning from parties, with or without their quarry in hand. Although Arna would not be able to give direct vocabulary or technical information, she could treat most any injuries, infections, and illnesses with the best of them. Combining her skills and her attitude, then it is all showcased in her constant berating of her patients for getting injured in the first place. With a word of encouragement, vote of confidence, or simple battlecry, Arna has the ability to envigorate teammates. Her inspiration dulls pain in their bodies while speeding up their recovery rate. Item 1: Killjoy: A classical halberd with silver trim adorning the haft. The head sports the expected ax, pike, and thorn combo, while the other end sports a blunted ball with several spikes for bludgeoning. Item 2: Steel Half-Plate: A custom set of half-plate armor designed by Arna to allow her steady defense with minimal mobility loss. This includes a standard breastplate, a gorget around the neck, and pauldrons on both shoulders. Her right arm is defended by a the full set of a rerebrace, couter, vambrace, and gauntlet, while her left arm is less defended, only sporting a couter. Her legs have a similarly low defense with only sabatons, greaves, and poleyns. There once was a young girl that lived in Springwood Village on the island of Bellmuse. This little girl's name was Arna Morado, and she had grown up seeing her family work among the domestic farmland for much of her life. They were laborers and often times had little time or energy to spend time with her, as well as often times being mistreated while they worked for their heritage. The faunus girl did not let this faze her however, as she often seeked out ways to entertain herself in other ways among the edges of Skylight Woods or near the lake's edge. Yet her youth could only last so long, as her family's poverty forced her to find a way to make money for her family as well. They young Arna was off put by plants though, and never wanted to work on the farms like her parents did, that seemed boring, and from her perspective, demeaning. Arna wanted to be a hunter, and live a life of adventure while she provided for her family. The need for food was high in Springwood, and Arna was a very healthy young girl. She learned how to fight because of this, knowing that the woods were dangerous and that many of the hunting parties included multiple people to make sure that they came back safely, and that was something that she could do. Although, she knew that, the others did not trust her to be so competent when the time came to fight. Instead, when she thought that she would be joining for the hunting parties, she was placed on recovery duty to take care of the people that came back hurt or sick. This was the first time that the young girl felt so betrayed by her genetics and the first time that she felt so looked down upon. Arna would never stop training though, and her work did pay her at the end of it all. In time, she was earning more than both of her parents, and still being able to put some money aside. She saved enough for a weapon, and saved enough for armor of her own. She trained with that weapon and armor and got stronger with each day, determined to prove them wrong and get herself into the field where she knew that she belonged. That day did not come for a very long time, and every time she tried, she was met with striking belittlement and contempt, which she grew to return to her humilators. Her tenacity was not in vain, and she was finally heeded by the hunt-captain to be sent with a hunting party as a field medic. These were not the circumstances that she had hoped for, but she was happy to finally be able to work the way that she wanted to after so many years. However happy she would be, this was not to stop her teammates from resenting having her along. This resentment would come to attract grimm, a whole pack of Beowulves, and lead to a massacre of her party. Her training left her as the only survivor, albeit with one less eye to serve as a mark to the rest of the village that she had not saved anyone that day but herself. The contempt only grew as she was now degraded more than ever. She was pulled from party rotation and told that it was only so she had time to recover, but she knew that it was only because no others would have her. With a fire burning in her heart, she continued to work, train, and beg for another opportunity to work in the field. It became a ritual for her for some time until one of the other field medics was forced to pull out of their party on an expedition to Finnek for the sake of his newborn child. This was her opportunity, as she was the only other field medic on standby, and her new party was forced to take her along. Destiny would have it that this trial was to go equally poorly, as her team came to abandon her in the woods so as to avoid the fate of her last party, assuming that she was just a bad luck charm. With no way to know how to traverse the forest after being disallowed from joining the parties and know knowledge of how to fend for herself for that exact same reason, she was forced to angrily wander the forest and hope that luck would spit her out to civilization. Little did she know that she was becoming a homing beacon for Grimm all around. After wandering and making threats to her party under her breath for a time, she broke into a clearing and felt as though she was finally nearing a way out. That is, until she was greeted by a half-naked child shouting excitedly and incoherently. Shortly thereafter, a giant of a man entered the clearing as well and both began shouting incoherently, much to Arna's confusion. The giant introduced himself as Tomm Torchman, and she introduced herself in turn; when asked about his own name, the small one introduced himself as Zeeb Zoobz, as odd as it was. Though their introductions were to be short-lived as the telling howls of Beowulves echoed from the trees as a pack descended upon their group. She readied her halberd and told the pair to stay behind her, but was surprised to see that they readied their own weapons, and changed her command to simply stay close together. They fought together, and in her fervor, Arna discovered her aura and semblance in one go as she served to enhance the abilities of the party with her orders. Before long, they had managed to fight their way out without a single scratch. They'd done more than survive there, they'd excelled, and because of their synergy, they stuck it out to finally find the edge of the forest together. This was where Arna would realize that she didn't belong back in Springwood anymore, even if it meant leaving her family behind, she made a decision that she was sure that they would understand when all was said and done. Arna asked Tomm and Zeeb to follow her to the academy to become warriors and heroes of the people. Surprisingly, they agreed with ease and their bond was formed as the beginnings of a team. The morning birds were chirping rather early as the sun had only just barely cracked over the horizon of Springwood and very few people were even considering stirring yet. There was one who was stirring, and had been for quite some time, Arna Morado. The little wolf swung her halberd at a dummy in the training grounds, occasionally whiffing completely and frustrating her, but that was the purpose of her vigorous training after all. Her new eyepatch was there to cover the ugly scar retained when her eye was unceremoniously removed from her head. Her depth perception was also wounded just as well as her body had been, as she learned to fight with only one eye from this day forward. Of course there were cybernetics nowadays, but there was no way a poor farming family could afford that. For now, she would just have to learn to deal with it, but dealing with things was not her strong suit. After the tenth or eleventh whiff, she had had it and leaped forward at the dummy and began pummeling it with her fists, earning a bit of catharsis as she worked out nearly a weeks worth of pent up stress in one go.